Prof.Dr. Hubert Rampersad co-founded the Authentic Personal Brand Coach Federation (APBCF) in 2013 in the United States as a nonprofit organization for fellow authentic personal brand coaches to support each other and grow the authentic personal brand coaching profession globally. Remember: Regardless of age, regardless of position, regardless of the business we happen to be in, all of us need to understand the importance of authentic personal branding. You are a brand and you are in charge of your brand. You need to think of yourself differently and become the CEO of your life. Authentic personal brand coaching is a spiritual, measurable, holistic, organic, and sustainable way to help people discover all that is within themselves and become successful in life. It is based on the bestselling books on Authentic Personal Branding of Dr. Hubert Rampersad, which have been published in many languages and endorsed by leading professors from Harvard Business School, Yale School of Management, and the world’s leading coaching expert Marshall Goldsmith . It is the world’s only real authentic personal branding methodology. That’s why it’s currently also being used at the University of California (UCLA) and MIT SLOAN. This organic, holistic and authentic personal branding system helps you to unlock your potential and build a trusted image of yourself that you want to project in everything you do. It also opens your view to new ideas, possibilities and business opportunities. It is combined with powerful tools to deliver peak performance and to create a stable basis for trustworthiness, credibility, and personal charisma. This new inside-out approach places more emphasis on understanding yourself and the needs of others, meet those needs while staying true to your values, improve yourself continuously, and realize growth in life. This is based on your life philosophy, dreams, values, identity, self-knowledge, self-awareness, self-responsibility, positive attributes, and self-management. 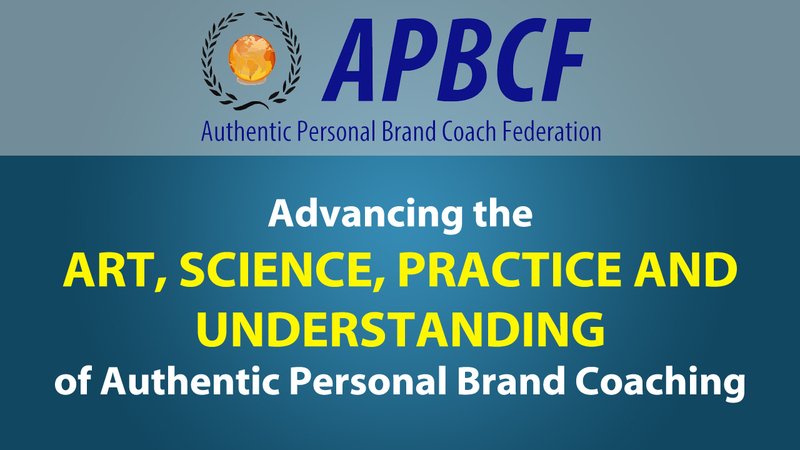 APBCF has become the global not-for-profit membership federation for the authentic personal brand coaching profession and for launching this movement globally. Whether it’s Life Coaching, Executive Coaching or any other professional coaching, APBCF supports the integrity of this growing authentic personal brand coaching field through professional standards and leads the global community in advancing this new profession. APBCF’s worldwide advocacy for authentic personal brand coaching is reinforced by our globally recognized certification and licensee programs, academic programs, chapters of practice in 50 countries, a worldwide network of professional APBCF coaches, and professional development opportunities. APBCF is recognized for: Developing authentic personal brand coaching core competencies, establishing a related code of ethics and standards, creating an internationally recognized credentialing program, setting guidelines for training programs, and providing discussion through communities of practice. Become a member and see what APBCF can offer you at every stage of your personal brand coaching career. Discover more about what our APBCF membership offers, and choose the type of membership that’s best for you. As an APBCF member, you gain exclusive access to APBCF publications and our standards, networking options with our chapters and online communities of practice, and career opportunities. APBCF supports its members globally through its website, publications and through continual professional development, including conferences and networking programs. APBCF also offers a comprehensive authentic personal brand coach certification program globally. You will demonstrate your commitment to the authentic personal brand coaching profession with an APBCF certification. APBCF is currently growing around the world very fast now. Our goal is to keep growing membership and maintain a solid direction, presence and professional voice for authentic personal brand coaches. Based out of Miami, Florida, APBCF also operates Regional Service Centres in Asia, South East Asia-Pacific, Europe, South America, Middle East, Russia, and Africa, leading the global advancement of the authentic personal brand coaching profession. The Authentic Personal Brand Coach Federation encourages members to volunteer in its activities. Many opportunities exist at both the local and global levels to become involved with APBCF and give back to the authentic personal brand coaching community. APBCF’s Board of Directors supervises the direction and control of APBCF and its committees according to our unique Authentic Governance System. Early 2014, the Board approved the appointment of five members, three of whom hold the offices of Chair, Vice Chair and Treasurer. Each Director serves a two-year term, with a maximum of two terms. The Chair is elected annually and can run for a second term. The Nominating Committee will present at least one nominee for each vacant or expired seat on the Board, and all APBCF Members have a voice and can vote. Helping APBCF in becoming an important resource for the business community. APBCF Chapters are led by local APBCF Members who are Master Certified Authentic Personal Brand Coaches. Volunteer opportunities may include serving on a local chapter board or assisting with local marketing efforts. Please contact local APBCF Chapters directly to get involved. We just want to remind you that we are not affiliated in any way with the ICF. However, we are grateful to the ICF for improving standards and professionalism among coaches and we support the good work the ICF is doing in the coaching field. We also know that many coaches with ICF designations are struggling to make a living because of the many shortcomings of the ICF approach, such as the incompleteness of the 11 ICF core competencies and its non-measurable and non-holistic approach. Read also this very interesting article “9 reasons that ICF competencies are not sufficient for success as a coach” from one of the leading ICF certified coaches in Florida, USA. Authentic Personal Brand Coaching has been proven in practice to produce sustainable results, not only for individuals but also for organizations. This holistic system is neither cosmetic nor cloudy, and therefore clients are experiencing concrete measurable results within a few months. I´m retired ad man. I started through Twitter a program under the hashtag todolqnoenseñan~and wish to know how can i start my personal coachiong business.